Happy New Year! 2014 has officially closed and a new chapter has opened called 2015. Many of us feel an excitement and rejuvenation this time of year. Whether 2014 was full of struggle or triumph, we look at the New Year as a clean slate that is full of potential. It is traditional to make resolutions during this time of year aimed toward improving ourselves or our community. 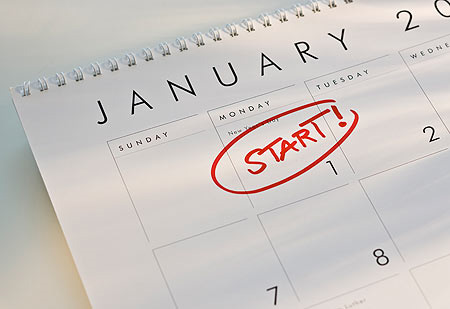 Personal health improvement goals are among the most common resolutions set for the New Year. In this week’s blog, we’ll outline a few resolutions that are easy to keep and sure to improve your health by 2016. Studies continue to pile on evidence that sleep is an essential aspect of overall well-being. And still, we stay up too late on our computers, or reading, or whatever other activity it is that keeps you from getting the recommending 7-9 hours of sleep per night. Without enough sleep, our bodies don’t function properly, making all of our goals much more difficult to achieve. Metabolism, which is an important aspect of digestion and weight control, is also affected by sleep. Start allowing yourself a wind-down period to begin relaxation before heading to bed. Just like sleep, the human body needs a steady supply each day in order to function optimally. Drinking more water is an easy change you can make at whatever pace you can manage. Try replacing non-water beverage with water every day, or even every other day if every day is too much to start off with. It is important to set realistic goals and slowly improve over time. For those of us who already love water, try drinking a glass of water 30 minutes before each meal. Doing so will aid digestion and keep you hydrated. Drinking water before eating a meal can also help prevent over-eating, by helping you feel full earlier. Open Enrollment for 2015 health insurance coverage is going on now through 02/15/2015. Health insurance is increasingly important for access to quality, affordable medical care. This coverage provides peach of mind in knowing you and your family are financially secure in case of hospitalization or other high-cost medical need. Modern health insurance plans also cover all preventative and routine exams at no cost to you, which is of great help in staying on top of one’s physical health during the New Year. The landscape of health insurance in the United States is much different than it used to be. You may have more affordable coverage options available than you think. Give Louis Barnett & Associates a call to find out more about health insurance coverage for you and your family during 2015.